Installing a shampoo and soap dispenser in your shower a great way to save you a lot of trouble. Apart from eliminating the clutter of having so many bottles of shampoo, shower gel, conditioner, and body wash in the shower, it’s also a way to save money by buying bath and shower products in bulk. 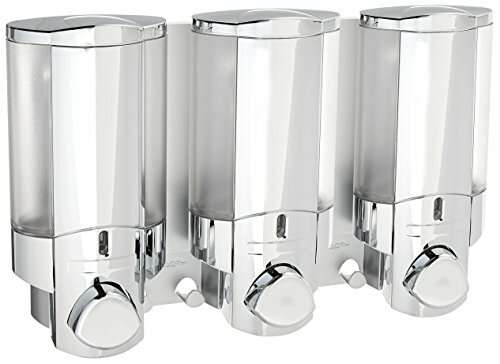 Hotel and motel businesses have been using these wall mounted dispensers for quite some time and they are gaining popularity over the wasteful use of miniature bottles. There are also benefits to uses these pumps in your home shower. If you currently use a shower caddy hanging from your showerhead where you store the bottles, you probably know it can turn into a cluttered mess. A wall dispenser is a useful way to organize your shower. There are a ton of these dispensers on the market so it may be difficult to choose the best one. 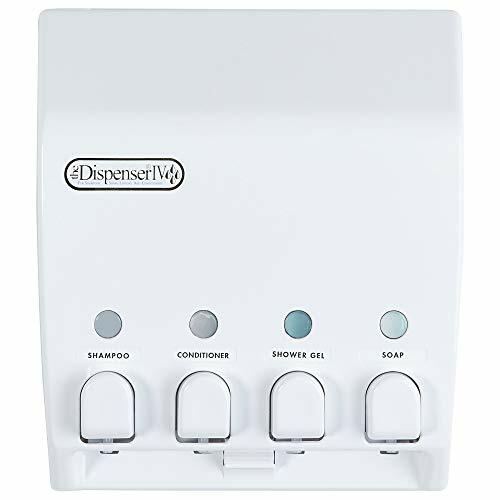 We’ve reviewed several of the best selling shower dispensers and narrowed our selection to three good options, along with their pros and cons below to help you choose. Based on its build quality and functional design we feel the Better Living’s Three Chamber Dispenser is the top choice in shower dispensers. See our detailed reviews below. This wall mounted option by Better Living has been widely regarded as one of the best dispensers you can find online. It offers three separate dispensing chambers capable of holding up to 11 ounces of liquid each. It also includes everything needed for its installation as well as two hooks attached on either side of the middle chamber, which can be used to hang razors, sponges or other handy showering commodities. This is especially useful if you shave in the shower using an in-shower shaving mirror. The dispenser clears up space in the shower so you have a more organized place to store your shaving accessories. One of the best features is its simple yet functional design, although the about the quality of the glue that is included may not be the best for the job. You could end up with a huge mess on the floor if not glued properly to the wall which is even more inconvenient if the adhesive’s quality isn’t the best. It’s recommended that you use BOTH the using waterproof silicone adhesive and 2-way tape that is included with the product. Chambers are easy to rearrange and they are easy to refill, although sometimes they might not dispense enough gel, making it necessary to pump a few times – especially if the owner has long hair. Good product quality that offers an above average lifespan. Easy to organize and rearrange chambers, which gives an extra touch of handiness. It has hooks that allow further arrangement of bathroom commodities. It can hold a decent amount of showering products within it. Single-chamber and two-chamber versions of the products can also be purchased if desired. The adhesive materials it contains don’t seem to be top quality, so others might be needed in order to keep the containers from coming off. One pump might not be enough to dispense the required amount of product. It can be inconvenient at times. This triple pump is made entirely out of silver-colored plastic, although it is plastic, the quality is very good and tends to last for a long time. As with other dispensers, the glue provided is not the best. With a little DIY, it shouldn’t fall off anytime soon. Drilling is recommended as the pumps are heavy and could wear down adhesives pretty quickly. The product is very good at dealing with even the thickest of shower gels and soaps. 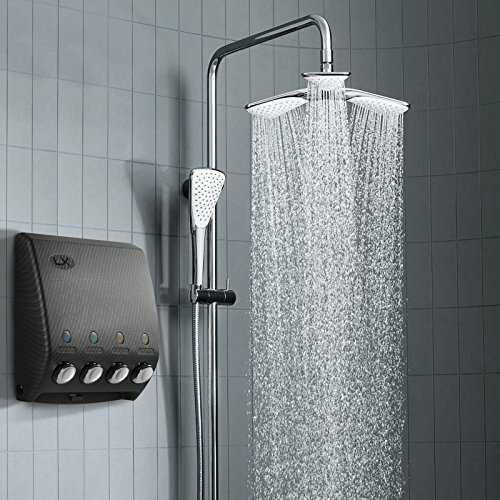 For me, this shower pump wins on aesthetics – the design is slick and gives a great vibe to the shower. Of course, a lot of it comes down to personal preference. Some buyers have reported leaking on certain pumps, but the good news is that they were replaced by the manufacturer after contacting customer support. Simple Human is a very established company and well known for the functional and elegant design of its products. My mother has one of their smart trash cans (with a motion sensor that opens automatically when you go to throw something in it) and can’t stop raving about it …and the company. The quality of the product rivals Better Living’s Three Chamber Dispenser. This product is a tad heavier though, which means those who live on a rented apartment or house might want to avoid Simple Human’s pump in order not to cause damage to the bathroom wall by drilling into it. Good quality, a water-resistant product that works as intended. Handles thick gels, shampoos, and soaps really well. Really heavy and tends to fall off if not properly attached (i.e. drilling). It’s definitely on the pricey side for a plastic dispenser. Another Better Living design, this product isn’t as visually pleasing (click to see photos) as its modern 3-chamber counterpart but overall it delivers exactly what it promises. It might not offer the same comfort and versatility as this one doesn’t have hooks or a platform to place other shower accessories, but it certainly has a better waterproof design, thanks to its hermetic shape. The only problem that this product seems to have is that pumps tend to fail after some time of usage. This model doesn’t have as much adhering issues as its other two counterparts, so it’s a huge plus for those living in a rented apartment. Easy installation with quality and already-included waterproof silicon. They also come in various chamber models like its Better Living counterpart. Indicator allows owners to easily know when to refill containers, even with its hermetic design. The bottles don’t seem to hold as much product as they should but still hold a respectable amount nonetheless. Dispensers might stop functioning sooner than expected. It doesn’t have room to spare for other commodities like other Better Living products. 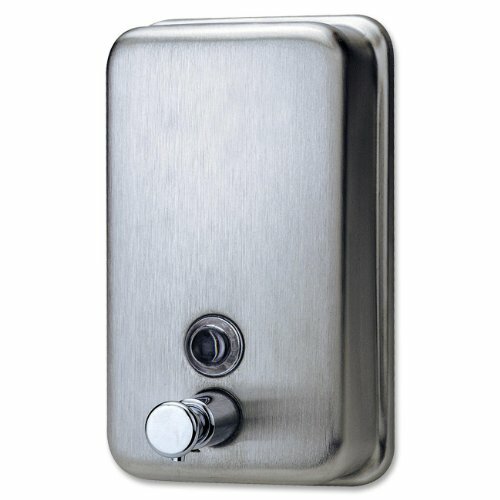 The Genuine Joe GJO02201 Stainless Steel Manual Soap Dispenser is a must-have for the man’s man. Its overall look is very masculine: minimalistic, made of stainless steel, and has a no-fuss vibe to it. It will surely fit right into any industrial or minimalist themed bathroom. The material is corrosion-resistant and rustproof. It is built to last, which is just what every home needs. Who has time to constantly change a soap dispenser? Simply mount it anywhere on your bathroom wall to give you easy access. There is a conveniently placed window that lets you peek in and see when it’s time for a refill. Never go into the shower wet only to realize you’ve run out of shampoo or soap in the middle of a bath! 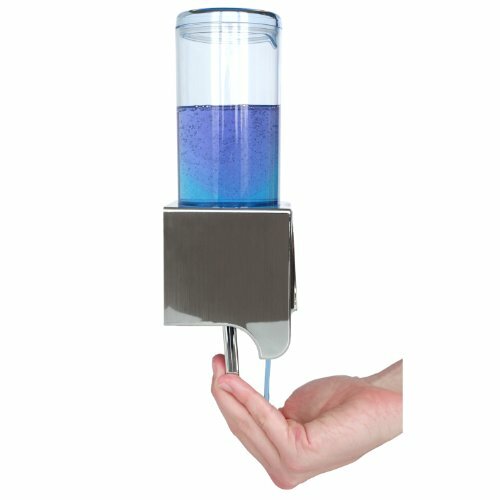 You can use liquid soaps, shower gels, shampoo, and conditioner for this dispenser. 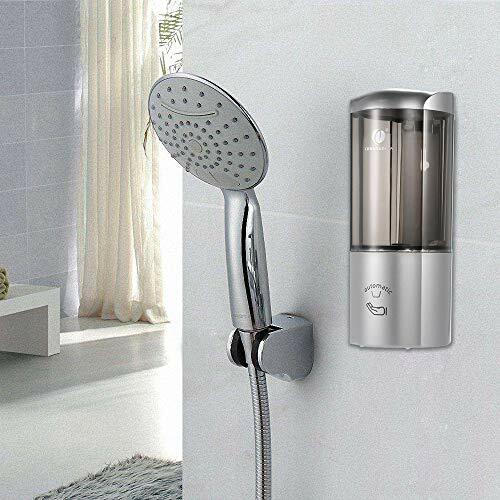 The Luxitude Shower Soap Dispenser is what your modern bathroom is missing. It’s not just functional: it’s also a nice little accent piece to your overall bathroom decor. Tired of the uncoordinated mess and clutter of your shampoo bottles in the shower? Get rid of these unsightly bottles and use a soap dispenser. Transferring them into the dispenser is very easy. It features four chambers, so you can have everything you can possibly need – but in an organized, clean manner. Simply remove the lid of the chamber you need, and pour in the shampoo or soap. Each chamber can contain as much as 14.5 oz. To install the mount, use permanent screws to hold it in place if you aren’t planning on moving the dispenser elsewhere. Still undecided? No worries – just use silicon tabs (included in the package) for a more temporary and soft installation. 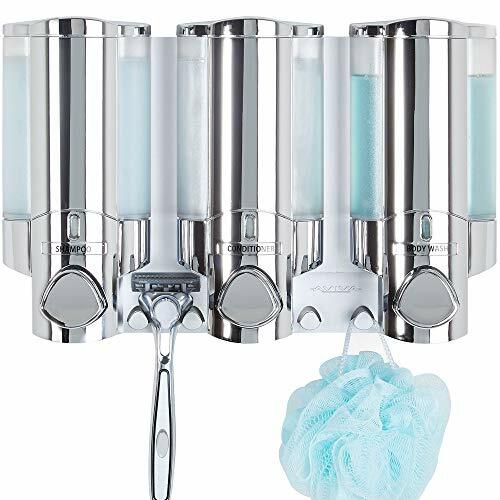 The purchase includes the dispenser, mounting materials, and labels (shampoo, shampoo plus, soap, lotion, conditioner, baby oil, and shower gel). This Anself CHUANGDIAN Manual Soap Dispenser looks elegant and can fit the decor that you have in your bathroom. You can use it for shampoos, shower gels, liquid soaps, sanitizers, and even lotions. If you hate having so many bottles cluttering up your bathroom, then it’s time to make the switch. No more mess, no more unsightly bottles lying around. The transparent dispenser lets you know if it is time to refill your product. 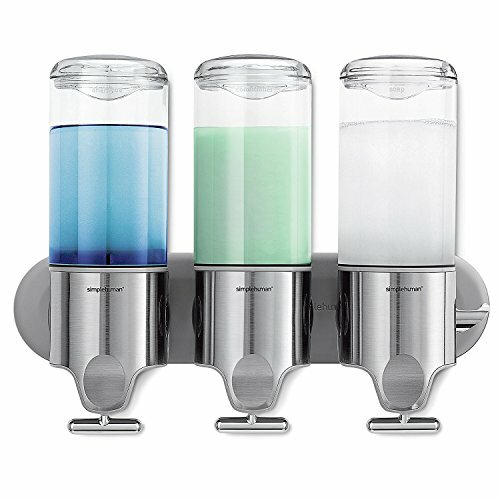 The refill bottle inside the dispenser can be conveniently taken out, so refilling becomes an easy task. You will find the nozzle to be very easy to use. It dispenses efficiently, so you save more by eliminating unnecessary waste. On top of the dispenser, there is a lock that comes with a key – a must-have feature if you plan on using this product for commercial or business purposes. Because of its high-grade materials and environmentally-friendly ABS plastic, it can be used at home, in the office, at schools, banks, hospitals, restaurants, and hotels. It is available in elegant colors: white, silver, and champagne gold. The ToiletTree Products Deluxe Shampoo and Soap Dispenser boasts a modern design. It solves the multiple bottle clutter problem in the bathroom. Anyone can install this easily – just stick it to your chosen spot in the shower or bathroom using the removable silicone gel, which is included in the package. You may also use double-sided tape for added traction. It has a pull bar dispenser, which is ergonomically designed, using your natural grip form. This way, you won’t risk accidents or injury in the bath: you’ll get nothing but the convenience and a very organized, clutter-free shower. Dispense your favorite shampoo, bath gel, liquid soap, or conditioner directly on your palms. The dispenser can contain 16 oz of product. The purchase comes with a 5-year replacement warranty. There is a huge influx of products in the market, with each varying in both quality and pricing. Some products have very elevated prices – sometimes even doubling the competitions price while not offering enough benefits to justify the hefty tag. While there are simple one chamber dispensers for under $15, most of the quality options we’ve found start above that price point and for 3 and 4 chamber options, they can go up to $75. It is important to consider how easily the dispenser rusts and how durable the products are. Constant use inside a shower will almost assuredly cover them with water after every use, and if the material isn’t waterproof or at least water-resistant it’ll rust easily and eventually break down sooner than expected. Most of the ones we’ve tested are made of hard plastic. While not the most durable material, it works well in the shower and eliminates the concern for rust which you get on wire shower caddies. Refilling a shower bottle time and time again is incredibly inconvenient. Owners and potential buyers tend to look for dispensers that are capable of retaining a decent amount of fluid, in order to avoid recurrent refilling. Look for dispensers with a large capacity of 14 ounces or more since many find that this is the optimal amount to reduce the frequency of refilling. While there are single pumps available for just shampoo, many people prefer to have at least two containers (for shampoo and gel or body wash) and having three chambers is probably the most convenient since it adds space for a third option (often conditioner or body lotion) and can completely eliminate the clutter of bottles in your shower. Although every product we’ve reviewed offers more benefits than its disadvantages, the Better Living’s Three Chamber Dispenser comes out on top of the others given its higher-quality material and the spare hooks it offers for shower commodities. If you live in a rented place, you might like to consider purchasing the Better Living’s Classic 4-Chamber Dispenser instead, though! Do you fancy other shower accessories for your bathroom? Adding a curved double shower curtain rod can also give you bath a much more elegant look -since it separates the liner from the curtain -the curtain hangs much nicer and it more hygienic since the liner doesn’t stick to the curtain and dries out completely-reducing the risk of mold and mildew.